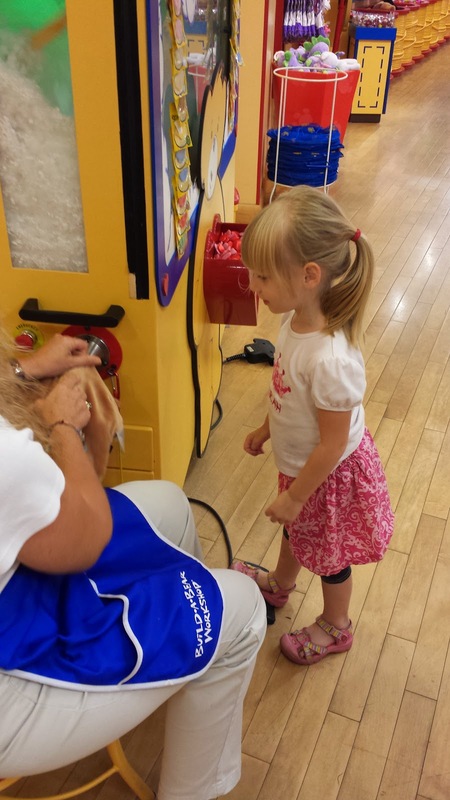 It's no secret we like Build a Bear around here. When Cody was born we bought Sarah and Cody a pair of brother and sister bears from there to commemorate the new addition to our family. This time we thought we'd borrow a tradition from Adam and Melissa to celebrate our new baby. Whenever they have a new child, they take everyone to build a bear and the older kids pick out and build a bear for new baby. Before we went into the store I made sure that Sarah and Cody both understood that we were not building bears for them tonight. 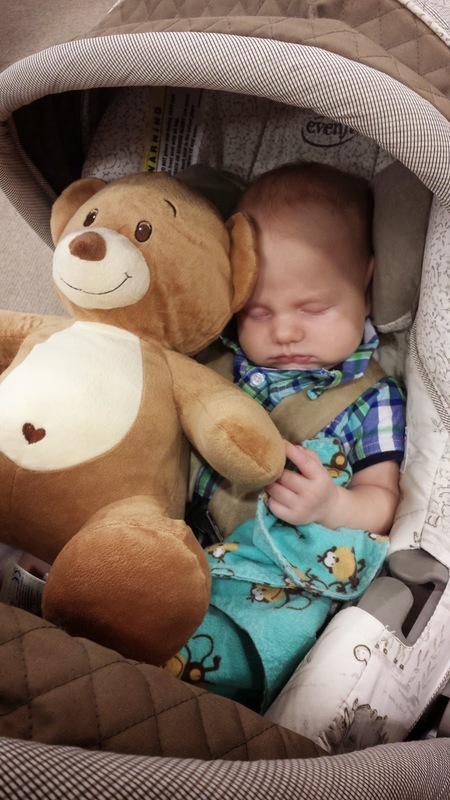 That together, they were going to pick out and make Charlie his first teddy bear. I also explained that mommy had full veto rights. (I didn't want Sarah to talk Cody into picking something pink.) The talk seemed to go well thankfully and both of them were very excited to do this for Charlie and neither of them tried to pick out something incredibly girly like a My Little Pony. They selected the most perfect teddy bear, everyone fell in love with their choice, and headed to the stuffing machine to fill Charlie's teddy with love and fluff. Sarah filled the tedddy bear with his fluff and then "washed" him at the bath station. Cody for some reason is still terrified of both of those machines. So I helped Cody register the bear at the computer station. His job was basically to hit the "green square" which was the enter button. So after I'd type a few words he'd say, "green square!" and jam that button like he was firing a laser. And least he enjoyed his one job. 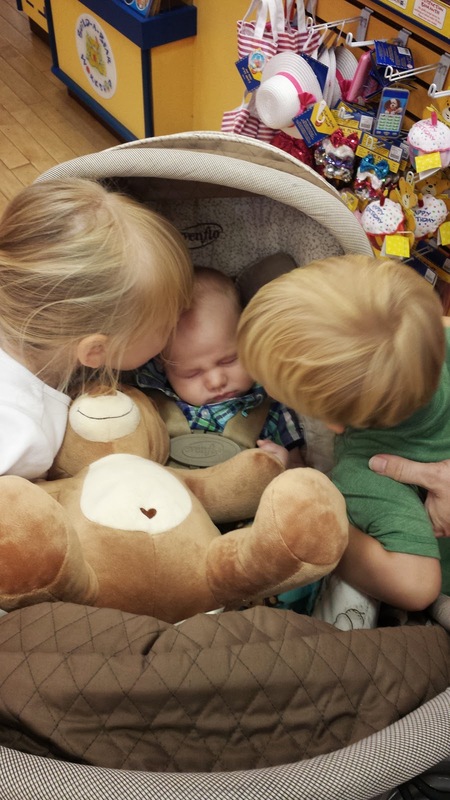 Giving Charlie his new bear a couple of kisses. Of course, both Sarah and Cody have tried to steal Teddy quite a few times since bringing him home. Cody was on the bed the other day trying to slyly slide it off the bed and when I saw him he said, "Charlie wants to share him with me." 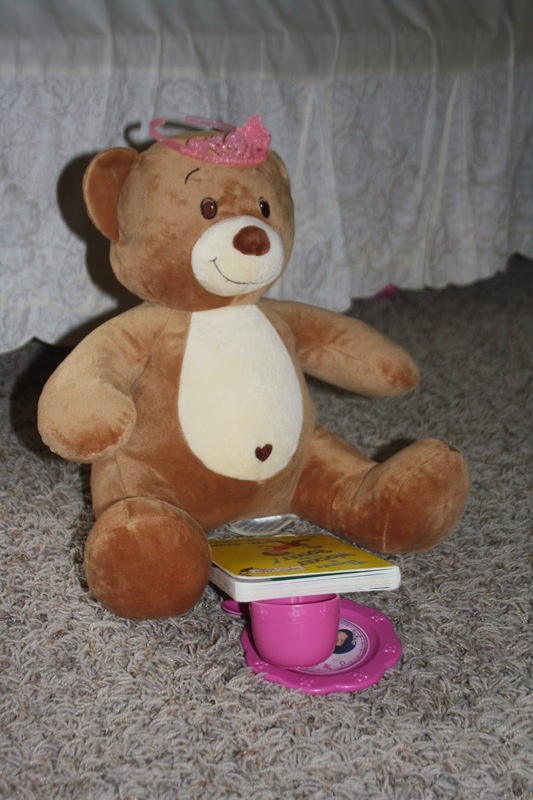 Sarah is smarter, she instead threw a teddy bear tea party to get her hands on teddy.